It’s time to get back into the Art Fair groove! I am glad I have a checklist because after 2 months I need a reminder of what to bring. 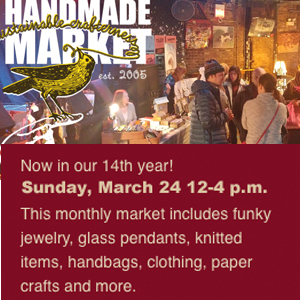 This Sunday, I will be popping up at the Handmade Market from 12 to 4 p.m.
Now in its 14th year, this monthly market includes funky jewelry, glass pendants, knitted items, handbags, clothing, paper crafts and more. The event is held at The Empty Bottle, 1035 N. Western Ave. in Chicago. Admission is free to the public, but you have to be over 21 to enter, or have a grown-up with you. The Empty Bottle starts serving at noon, so feel free to shop with mimosas in hand. (You can also grab brunch at the tasty Bite Café next door. Ballion Design by David Staudacher ~ Handmade Jewelry from Ballion Design. We turn vintage and antique silverware into one-of-a-kind rings, earrings, bracelets, pendants and more. Bangin’ Designs by Jackie Peoples ~ Metal jewelry hand forged from sheet and wire. I work in copper, silver, bronze, and some nickle. Big Oaks Soap Co. by Solange Kapheim ~ Handmade, small-batch soaps using natural colorants (spices/clays) and essential oils. Carolyn Dunn ~ abstract paintings using enamels, resins, and a variety of paints and mixed media objects. Most of my abstracts are painted on small tiles and panel boards and are pre-framed if the customer desires the frames I provide. Essimar by Esther Essimar ~ Handmade paper craft goods, made in Chicago, since 2006. Flowers in Threads by Victoria Ong ~ jewelry and accessories woven from cotton thread into shapes and forms of flowers using the knotted lace technique. hnprints by Nicholas Michael Hnastchenko ~ Landscapes, hands, and portraits. Linoleum cut blocks, ink on mulberry paper. Hooked Swimwear by Svitlana Kyfiak ~ handmade crochet clothing brand, that focuses on creating custom swimsuits and tops. It is made for romantic, intellectual, smart, feminine, flirtatious women, who love natural, unique, custom made products. MiBolsa by Judi Kickel ~ Durable upholstery fabrics of mixed color, pattern, and texture to create pleasing designs in my one of a kind messenger bags, totles, and wall hangings. Moonstone Chandlery by Maureen Williamson ~ Hand Poured Crystal Infused Soy Healing Candles and Smudge Sprays. Our candles are made with essential oils, herbs and 100% soy wax. Each candle and spray is Reiki charged with a positive intention to support the wellness of its user. Off The Hook Crochet by La’Shawn Sandifer ~ Fun and flirty one-of-a-kind, seasonal crocheted wraps, ponchos, shrugs, throws, hat & scarf sets, totes. Pure and Simple Studio by Maggie Lamain ~ provides handmade, all-natural products to our customers. We are focused on healthy skin care and household cleaning products. Silver&Fold by Johnna Carlson ~ artfully handcrafted, paper cut greeting cards, inspired by a passion for all things aesthetic, creative, and often a bit comical. The layering of graphic design, unique cuts of paper, and other surprising materials, make my creations the perfect one-of-a-kind gifts for anyone and all occasions. stephXstitch by Stephanie Rohr ~ Cross stitch is cool again! I use this traditional method to create one-of-a-kind, sassy and subversive art that is cheeky, fun, and still beautiful to look at. Tendaji Body Oils by Carla Tate Anderson ~ Handcrafted Skincare Products that are Natural, Organic and many products are also Vegan Based. Waterfall Glen Soap Company, llc. by Douglas Coggeshall ~ A vegan soap and cosmetics company, focused on the ART and SIMPLICITY of natural goodness in healthy skin care and bathing pleasure. I am excited to browse this amazing collection of artists myself. It truly has something for everyone. Can’t make it this month? I will be back on Sunday, April 28th as well. 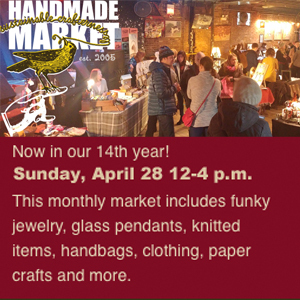 This entry was posted in Art & Culture, art fairs and tagged #shophandmade, art fair, Handmade Market, Handmade Market Chicago, March art fair, pop-up shop, Sunday art fair, The Empty Bottle, trunk show.